Sumba is a small, arid island about 300 miles to the east of Bali. The main exports are cattle, Sandalwood horses, and textiles. 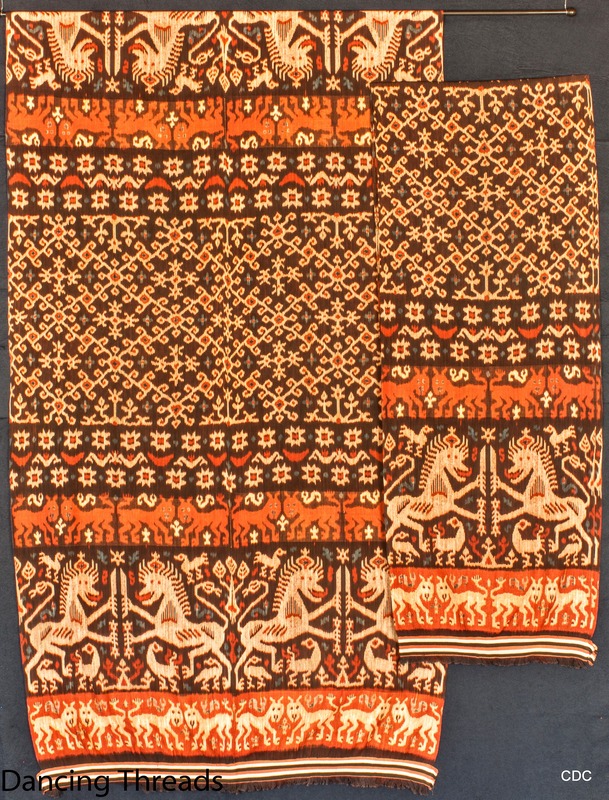 Sumba’s hinggi (men’s blankets) are unique in Indonesia in their bold, dramatic, pictorial iconography. Interestingly, no one knows how this came to be. Why, on this small island, with one foot still in the megalithic world, with its very small population and small number of weavers, was such a radically different textile tradition created? Furthermore, these textiles have become well known worldwide, to the extent of being sold in large department stores in London and Amsterdam as long ago as the early 20th century. Weaving is found only in the far east and far west of the island because of an ancient belief that the island is suspended in place by cosmic threads passing through the center of the island. Weaving in the center of the island might weaken the cosmic threads resulting in the island falling to the bottom of the sea. Classic hinggi, these large rectangular warp ikat men’s pieces are the best known of Sumba’s textiles and those which are most different from all other Indonesian textile traditions. Made in identical pairs, they are mirror images end to end and side to side, and have an uneven number of horizontal bands ranging from 5-11. Only two colors, indigo and red, are used in the dyeing but in combination they can create a fairly broad palette. On some pieces the ends are finished with a woven strip, called a kabakil, to further enhance the piece and to secure the warp threads. Hinggi creation is a long, complicated process. Spinning of the thread can be done only in the dry season and dyeing takes place at the end of the rainy season when the indigofera plant is plentiful so adequate dye can be made. Warping and binding the threads can be done at anytime, but the weaving can be done only at the driest time of the year or the threads stick together, tangle and break. One piece takes a minimum of a year and could take much longer depending on the complexity of the pattern, how many colors it has, and the level of color saturation desired. Men wear hinggi on important occasions, usually with one tied around the hips and one at the shoulders. At death a noble will be wrapped and buried with dozens or even a hundred or more of the finest hinggi. They protect his soul from malevolent forces and identify him to his ancestors in the next world. At the death of a some nobles a slave wearing the noble’s ceremonial costume rides the noble’s horse to the gravesite and plays the noble’s part in beginning his journey to the other world. Thenceforth, the slave is free. In a royal wedding, the bride’s special servant dresses as the bride in order to play the bride through the pomp and circumstance of the ceremony while the bride comes and goes, enjoying the festivities. It is through the wearing of the special ceremonial textiles which makes these substitutions possible. It must be noted that these men’s pieces, which are central in usage and meaning to the Sumba culture and have achieved world renown are created by women. The achievements of these women cannot be easily understood by outsiders. They go about their daily lives, working constantly, caring for their families under difficult conditions, helping in the fields and gardens, pounding the rice, grinding the maize, cooking, making clothing, and yet find time to control their world of textile creation. Entering a world men cannot understand, where they plant and harvest cotton, spin the thread, create the dyes, design and tie the patterns, dye the threads, and then weave the piece, they create a beautiful, important textile. They have, through this long, complicated process which is steeped in ritualistic tradition, captured the spirit world which is necessary for the effective use of the piece. Also, a woman passes life to her child through the threads of the textiles created. A Sumbanese girl begins the long process of learning to weave at about 11 years of age, learning first to spin the thread and progressing through the more complex processes until she actually begins to weave at 17-18. Being able to weave an ikat by herself is a sign she’s achieved womanhood and it is a prerequisite for marriage. Her prospective mother-in-law examines her weavings to learn the girl’s true nature in order to determine her fitness for her son.